Paradise Adolescent Home would like to thank the following individuals and businesses for their generous support towards the 2011 luncheon. 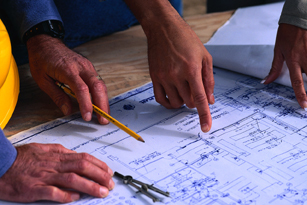 Please view our latest news and articles written about us in the press. Coming Soon ....Paradise Annex - A home for thriving and successful young women who are taking control of their lives. SAN RAMON -- Members of the Oakland Raiders hosted an early Thanksgiving meal for a group home in San Ramon on Wednesday evening. The football players' visit to the Paradise Adolescent Home was arranged by Alameda Contra Costa Links, a chapter of the larger African-American women's service organization. Players scheduled to attend were outside linebacker Quentin Groves, outside linebacker Sam Williams, linebacker Bruce Davis, outside linebacker Ricky Brown, outside linebacker Thomas Howard and defensive end Trevor Scott. The nonprofit arranged similar events this week with youth in Oakland at St. Leo's School and DreamCatcher Emergency Youth Shelter and Support Center. The Oakland Raiders took part in three special events in the local community during Thanksgiving week. Linebackers Quentin Groves, Sam Williams and Bruce Davis pose for a photo during their visit to Paradise Adolescent Home in San Ramon, Calif. Photo by Tony Gonzales. The Oakland Raiders, with the help of the Alameda-Contra Costa Chapter of The Links Incorporated, gave back to organizations in the local community for the Thanksgiving holiday. CBs Jeremy, Walter McFadden and S Stevie Brown delivered food to Saint Leo The Great School, while safeties Mike Mitchell, Tyvon Branch Michael Huff and CB Nnamdi Asomugha visited Dream Catchers Youth Shelter and Support Center in Oakland, Calif. LBs Quentin Groves, Sam Williams and Bruce Davis catered Thanksgiving dinner and spent the evening with the ladies of Paradise Adolescent Home (PAH) in San Ramon, Calif. The Links Incorporated is a "non-profit, community-based organization of about 12,000 women of color and our primary objective is to give back to the community," said Alameda-Contra Costa Links Chapter President Angela Harris. "We come together in our communities and we do programs to help uplift those that are in need." 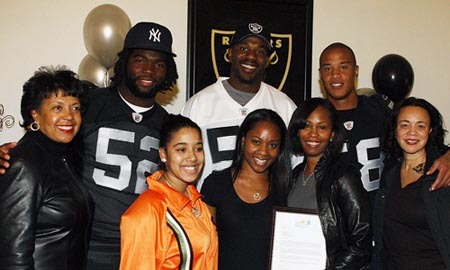 Links suggested three youth organizations for the Raiders to give back to for Thanksgiving. Rookie defensive backs Jeremy Ware, Walter McFadden and Stevie Brown (not pictured) visited Saint Leo The Great School Monday evening. The rookie defensive backs visited Saint Leo The Great School on Monday, bringing dinner for the families. "They have a lot of kids in need that are on financial aid at the school. We asked the principal, who is a member of our chapter, to locate some families that needed help for Thanksgiving," said Harris. The DBs had the opportunity to meet the families after bringing them bags of groceries. "They were telling us how much they appreciated it," said Brown. "One of the moms was telling us how she was the biggest Oakland fan. [Another family], the mom had a little boy, his name was Sammy, he was showing me all over the classroom because it was his classroom. He was showing me everything that he had colored in there. He was showing me the little lizards; he was walking me everywhere." The rookies were happy to make an impact during their first holiday season in Oakland. 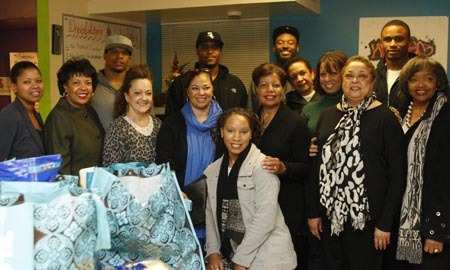 On Tuesday, Mitchell, Huff, Branch, and Asomugha donated bags of food to Dream Catchers, an organization that aids homeless and runaway youth. The defensive backs had the opportunity to meet some of the kids, sign autographs and pose for pictures. "It’s an honor," said Mitchell. "It’s truly a blessing that we’re able to come out. It really makes us feel good. Thanksgiving and Christmas is the season for giving and helping others and we’re just all happy and excited we could get out and give back to the community a little bit." Branch was also thankful to be able to give back at the start of the holiday season. "It’s great to come out and give back because we’re blessed to be in a position we’re in," said Branch. "To come out to share those blessings with the less fortunate is great." 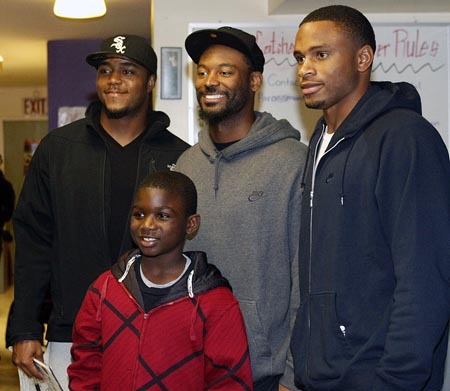 Tyvon Branch, Mike Mitchell, Michael Huff and Nnamdi Asomugha pose for a photo during their visit to Dream Catchers. Photo by Tony Gonzales. The Raiders also visited PAH in San Ramon. Groves catered a Thanksgiving meal and invited Williams and Davis to join him in visiting the young ladies for the evening. PAH, started by Maritza Jefferson-Gregory 11 years ago, provides assistance to girls and their families in crisis. "I decided that I wanted to do something to give back to the young ladies in the community who at times have issues beyond their control," said Jefferson-Gregory. The linebackers brought food, ate with the young women, and spearheaded a dance contest. "Tonight I’ve seen these girls like I haven’t seen them before," said Jefferson-Gregory. "They came together, they’re united, they’re having fun. It was just great. It really was amazing, an amazing experience." Groves was excited to be able to give back during the holiday season and to bring joy to PAH. "The girls didn’t stop laughing all night," said Groves. "I think they’re going to be talking about this until next Thanksgiving. It’s big for me because coming from such an underprivileged family it’s always helpful when somebody can relieve a burden so that’s what I thank God I was able to do tonight, was relieve a burden from these ladies." "A lot of times a lot of the girls don’t have families to go to so it means a lot to them," explained Jefferson-Gregory. "Just being able to be around a family environment and have a meal means a lot for them." Williams and Davis were glad Groves asked them to come along. "It’s always a special feeling to give back on Thanksgiving, especially to kids like this, they were so loving, just needed some food and someone to talk to and spend time with so it was a special occasion," said Williams. "Thanksgiving is a time for giving and that’s what we’re trying to do." "It means a lot just given the opportunities that we have because of our profession, our platform that we’re on," said Davis. "It means a lot because there’s a lot of people out there who just need food or something as simple as somebody to talk to or hang out with for a couple of hours. To come out and help make these girls’ night was just amazing. I’m glad we could make them smile and enjoy themselves for the evening." The Oakland Raiders spent Thanksgiving week giving back to the community. 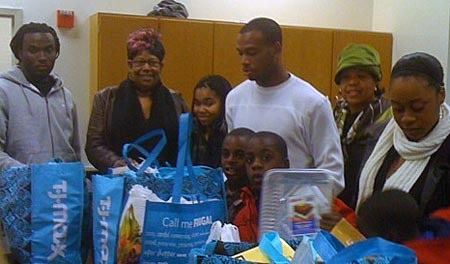 The players were honored and humbled to bring food and joy to young people during the holiday season. A nonprofit set up the holiday visit, which brought out several football players the night before Thanksgiving. On Wednesday evening, Raiders linebackers hosted a Thanksgiving dinner for the residents of Paradise Residential Homes in San Ramon. Paradise Residential Homes is a place for youths who have left foster care. The visit was set up by Alameda Contra Costa Links, a local arm of an African-American womens' service club. Players who attended: Outside linebacker Quentin Groves, outside linebacker Thomas Howard, linebacker Bruce Davis, defensive end Trevor Scott, linebacker Sam Williams and outside linebacker Ricky Brown.